Pressure washing is one of the most affordable ways to increase a home’s beauty and value while at the same time, restoring and extending its life by removing harmful dust, dirt, mold, mildew and other environmental pollutants. Our cleaning company is committed to offering prompt, courteous, and professional pressure washing services to residential and commercial customers. Utilizing professional equipment and commercial grade cleaners (if needed) that are both environmentally friendly and safe near landscaping, children, and pets. 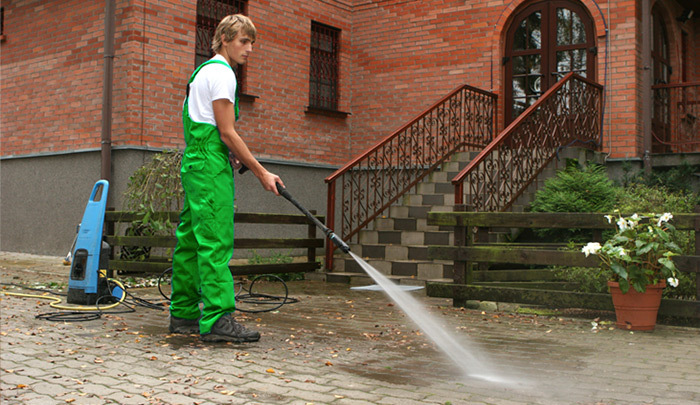 At A Step Above Cleaning Services, our power washing services are designed to get your property looking its best. No matter how dirty or stained your surfaces are, we’re ready to attack the problem using state-of-the-art equipment and techniques. Whether you want to remove rust, oil, grease, mildew, or any other unwanted stains, we can provide you with a customized cleaning solution designed to produce remarkable results. We specialize in exterior pressure washing, concrete, brick and paver cleaning, as well as restoration and sealing. By choosing Step Above Cleaning Services for Power Washing, you can get a company that knows how to clean all types of exterior surfaces. Whether it be your deck, house, fence, garage, concrete driveway or pavers, we can do it professionally and offer 100 percent customer satisfaction guaranteed! For more information about our power washing services or to schedule an estimate, call us today.